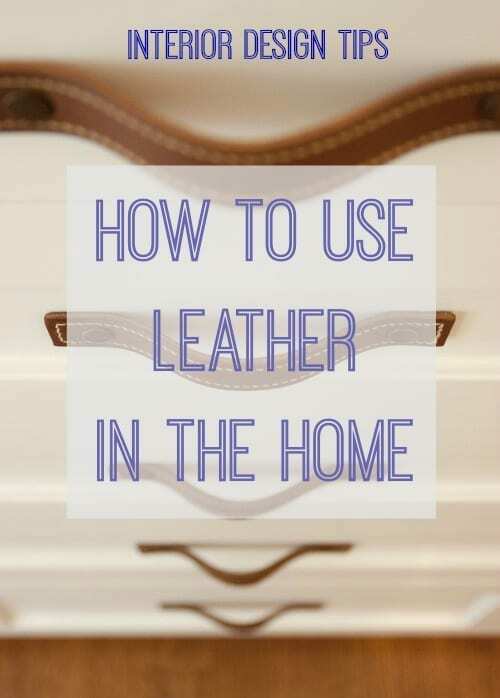 As homeowners we are always looking for new and exciting ways to decorate our homes, and although leather might not be anywhere near a new interior design innovation, it can still be used to great effect in a variety of ways. Read on as Metropolitan Leather Co Ltd – suppliers of high quality leather in any quantity, thickness, colour, texture or size – outline three smart interior design ideas for using leather in your home that you may not have considered. This season – and for some time now – it is all about textures and natural materials, and leather is ideal for creating this design effect, but how can you use it? In 2014 and for 2015 it is all about contrast, and frankly, if your home boasts uniform design it is probably looking a little dated and dull. Texture brings a room to life – especially a natural texture like leather. A good rule of thumb to consider when looking to mix and match textures is balance them out with their opposite, so for example a combination of leather and satin would be perfect. However, it is important that you don’t overdo it, so avoid combining any more than three textures within one feature. Implementing it as a wall feature is a great way of adding a touch of creativity to a feature wall. Combine different colours and textures together within one feature or maybe use it as backing to another feature element, such as a clock or picture frame. It is by introducing these bold elements of texture or colour that can really set your home apart. What’s more, a feature wall can also be a real conversation piece for friends and family! What you will probably have seen less often, but that is no less of a great interior design idea, is the use of leather floor tiles. Perfect for the bathroom thanks to its waterproof qualities and comfortable feel, leather floor tiles can also be used to great effect in living spaces such as the bedroom or living room, though we’d advise exercising some restraint in regards to how wide an area of leather flooring you utilise. Just like with your walls, contrast is key in these spaces, and an area of leather floor tiles – perhaps in the centre of the main seating area for example – could deliver a fantastic alternative to a rug. How do you utilise leather throughout your home, and what do you consider to be an underused interior design technique using this versatile and durable material? Let us know in the comments below. This guest blog was written by John Rooney on behalf of Metropolitan Leather Co Ltd – one of the UK’s premier suppliers of high quality leather products for use in fashion, industry and throughout the home. I hadn’t thought of the floor. I was thinking about the sofa, and then changing the look with cushions.